April 4th Show : Blog Of The Nation Today on Talk of the Nation, airline safety and customer satisfaction, one proposal for the budget, Elijah Anderson and The Cosmopolitan Canopy, and NPR'S Mike Pesca previews both the men's and women's NCAA basketball tournament finals. 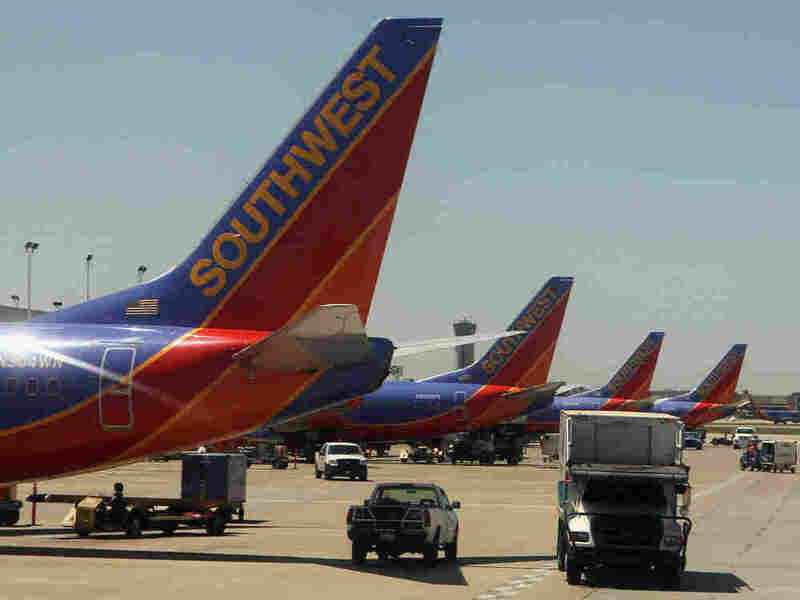 Southwest Airlines found cracks in three planes and is expected to cancel more flights today as it continues to inspect many of its older Boeing 737s. One of the planes was forced to make an emergency landing on Friday when a hole opened in the top of its fuselage. The problem comes at a challenging time for the airline industry. Fuel prices continue to rise and a report released today shows that despite some improvements among airlines in on-time performance and baggage handling, airline customer complaints jumped nearly 30% last year. Host Neal Conan talks with Joe Brancatelli, business travel columnist for Portfolio.com about why passengers complaints are up and with aviation expert Clive Irving about the mechanical problems that led to the Southwest scare on Friday. While lawmakers work on a new budget deal to avoid a partial shutdown of the federal government this week, many economists, lawmakers and finance experts are worried about the long-term deficit. This week we'll have a series focused on solutions and a variety of ways to combat the escalating federal debt. Today, Steve Bell begins the series. He's a senior director at the Bipartisan Policy Center. A longtime Republican Congressional staffer, his budget report advocates for a mix of tax increasing and cuts — including a one-year payroll tax holiday. In many cities, residents are clearly divided along lines of class and race. Yale sociology professor Elijah Anderson says those boundaries are normal, but he encourages what he calls "cosmopolitan canopies" — places like Philadelphia's Reading Terminal where people can cross those barriers. In his new book, The Cosmopolitan Canopy: Race and Civility in Everyday Life, Anderson explores a number of places in Philadelphia where people of all races mingle and talk and observe each other. Anderson joins host Neal Conan to talk about the book and his argument that cultivating more of theses spaces will gradually reduce the racial boundaries between surrounding, often deeply segregated neighborhoods. It has been another month of upsets and Cinderella runs at this year's men's and women's NCAA basketball tournaments. It all wraps up this week. Tonight, the men of the University of Connecticut and Butler University will take to the floor in Houston for the championship game. It's been an improbable run for both teams. And the women's championship tips-off Tuesday night in Indianapolis with a surprise matchup between Notre Dame and Texas A&M. NPR Correspondent Mike Pesca is in Houston and joins Neal Conan to talk about the road to the final games, the match-ups and the last-minute upsets.